Sunday Onayiga, with a knife. 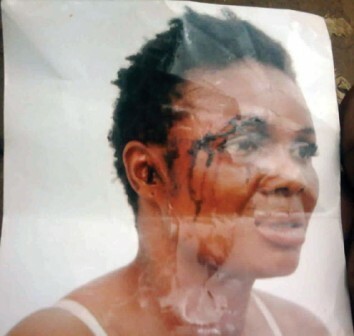 She is now in prison custody at Kirikiri, Lagos, for alleged murder. Egbeda, Lagos, where they have lived for over two years. The angry woman insisted that he must marry her because he promised to marry her two years ago. news to her that he was no longer interested in the marriage. She reportedly hit his head on a wall and took a kitchen knife and pursued Sunday to the Police Station at Idimu to kill him. The police arrested her and charged her to court for attempted murder and conduct likely to cause breach of public peace. The embittered woman lamented at the open court that he has used her for two years and now wanted to dump her for another woman. She is facing a two-count charge of assault and conduct likely to breach public peace. Narrating her ordeal, Sunday said he met her at Ikotun area and told her that he loved her and wanted to marry her. come and live with him and promised to meet her parents. Bukola said that she started living with him as his wife not knowing he had another thing in his mind. She said that she was shocked when Sunday told her that he no longer loved her and that the marriage had been cancelled. manage her as wife. Bukola was later charged to court for the offence. granted her bail in the sum of N250, 000 with two sureties in like sum. She was remanded in prison custody at Kirikiri, Lagos, because she could not meet her bail conditions.